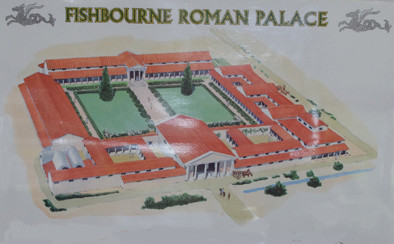 Today I visited the Roman Palace at Fishbourne. I remember it being discovered in the 1960s when I was a school boy but I do not remember ever visiting it. It was found by construction workers who uncovered a mosaic floor when digging up land to lay drainage pipes for a new housing development. 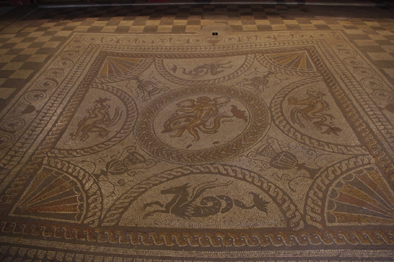 The floor, known as the Dolphin mosaic, was almost perfectly intact and astounding in its beauty. Fortunately, the land was then bought by a rich benefactor so that the housing development did not take place and further discoveries could be made. It certainly seems that it was a grand palace and that an important local ruler lived here. In its heyday it probably housed about a hundred people, which included men, woman, children and slaves. It is now considered an important part of Britain’s heritage and is well worth a visit.